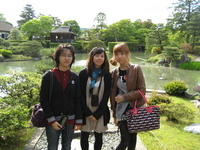 The students of the short term class went to the Katsura Imperial Villa in Kyoto. Normally you can't visit the villa freely. At least not without a prior reservation. 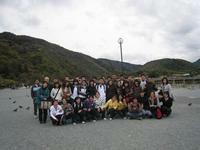 The tour takes about 1 hour and you will be accompanied by a professional guide. He will explain about the garden itself, the history, the intension of the designer, the purpose of various structures etcetera. We had a good time and it was a very meaningful excursion. The students watched the garden with great interest. 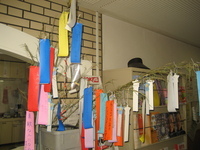 Setsubun is the day before the beginning of each season in Japan. The name literally means "seasonal division". Accompanied by a special ritual to cleanse away all the evil of the former year and drive away disease-bringing evil spirits for the year to come. 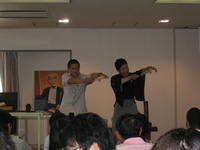 This special ritual is called mamemaki, (bean throwing). Also this year on the 3th of February we had the pleasure of bean throwing. Suddenly a lot of evil spirits appeared but the students have firmly driven them away. We are sure that good fortune will come! A former student came to visit us. 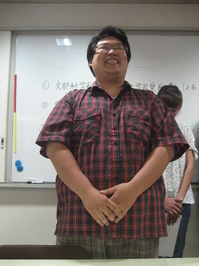 Shisei Chin, who has graduated last year, came to visit us. 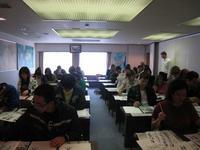 At the moment he is learning how to make sweets at a Japanese technical school. He came to bring us a self-made cake. On top of the cake he created a child's dice game about life, choices and careers which was eatable. We were deeply moved to see he tried to visualize his own career on the cake. Also the taste was very good! Shisei, thank you for the delicious cake! Please come visit us again! 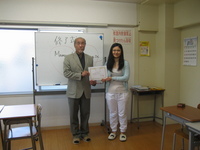 We held the coming of age ceremony at our school. This year a total number of 28 students became adults. They wore Japanese kimono, drank sacret Japanese sake and received the testimony of adulthood from the chairman of the board. Also this year we asked a professional photographer to take pictures. We are planning to send those pictures to the parents. The other students clapped and cheered loudly for their classmates. During the preparation time of the kimono they all listened to the stories of the teachers about traditional Japanese clothing. They were very interesting stories that even I as Japanese had never heard of. The long sleeved kimono that unmarried women wear is called furisode in Japanese. The long sleeves were used for wiping the tears when the women was sad and so these sleeves know the sadness, happiness, loneliness and the life of the women who wore that kimono. When the women gets married, those sleeves are cut off and when a child is born, a traditional Japanese doll will be made from those sleeves according to the teacher's story. 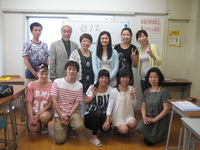 The female students who wore those kimono and the male students who wore a male kimono looked a bit taller than usual. 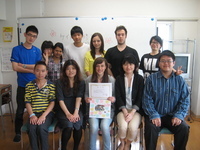 The graduation Japanese teacher course student graduation. This time, 8 people have graduated after 420 hours of class. The students of the 3 month course have studied the theory, made exercises, constructed teaching plans and learned how to use teaching materials. It must have been very hard for them every day. Thank you for your hard work. 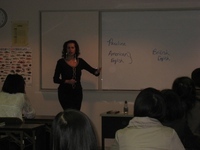 One former student went immediately to Nepal to teach at a school that we are cooperating with. 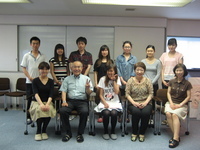 The other students are preparing to go to Thailand, a partner school in Bangkok, a Japanese language school in Weihai, China, a university in Nanjing and other Japanese language schools to teach the Japanese language. 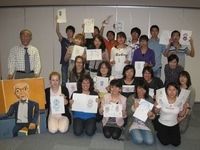 We as staff of Kyoto Minsai Japanese Language School are very pleased that all the students who have worked so hard were able to graduate and go to various Japanese language schools. Students, who are studying at the moment and future students, try to do your best to not lose from your older graduates. Uesugi Kenshin's death poem paragraph. On January the 5th, a person named Samual from Oman came to visit our school. After he saw the school, he started to talk about the death poem of Uesugi Kenshin while drinking a cup of Japanese sake at the school's cafeteria. "Forty Nine Years; One night's dream. A lifetime of prosperity; a cup of sake." (These 49 years of my life have passed like one night's dream. My life has been full of glory and prosperity, like a single cup filled with sake.)" If you were told by an inhabitant of the Arabic peninsula that the glory of this world is similar to 1 cup of sake, it makes you think about how many cups of sake the prosperity of Dubai is worth. Samual is studying about the Japanese warring states period at university in the city of Muscat in Oman so that's why he knew about this death poem. まごころが　つたわってきました。ひとつひとつに　クラスで　べんきょうした　ひらがなで　メッセージも　かいてあって、かんどうしました! 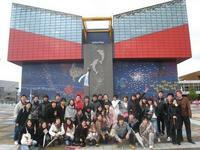 On March 2, 2010, the students went to visit a market. Every morning at weekdays there is a big auction where several shop and restaurant owners gather to buy the food for their business. The students were quite surprised to see the very large terminal and the large amount of fresh fruit, vegetables, and fish. There were many workers who drove the pallets of food with various kinds of forklifts and reach trucks from one place to another. It was a shame they couldn't see the auction but thanks to the explanation of Mr. Kashiwagi they could get a good picture of it. After that they went to visit the Umekoji Steam Locomotive Museum. In the museum were many posters, models and timelines to explain about various things like the history and the operation of the steam locomotives. Especially the real size cabin of a locomotive seemed to interest the students. There was also a locomotive exhibition site were a Total of 18 real size locomotives were displayed. According to an employee 12 locomotives are still working. Last but not least the students made a ride in a real locomotive which they seem to enjoy very much. 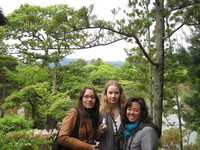 On 23-02-2010 the students went to the Sanjūsangendō. This is a Buddhist temple in the Higashiyama District of Kyoto. The temple name literally means Hall with thirty three spaces between columns. Before entering the hall, Mr. Yamamoto explained about the temple itself. The students looked very impressed when entering the main hall. There are about 1000 resembling Kannon (Buddhist deity of mercy ) statues which is an impressive sight. If you look close you'll see that not one statue is the same. They have all different faces. Not only the statues were very impressive, also the structure itself. It dates from 1266BC and it is earthquake resistant. After taking the memorial picture, we went to a Machiya. This is Japanese for inn; lodging. It is owned by the architectural school of Kyoto. We got a brief history lesson about the history of the houses in Kyoto and the structure itself. 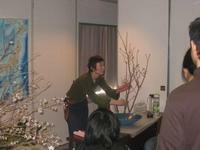 After that we went upstairs and participated in a tea ceremony held by the students of the architectural school. The students were quite moved by it. It takes a lot of time and effort to study the tea ceremony. Every movement has its own purpose. Everybody also seemed to enjoy the tea. Last but not least we went to a Japanese restaurant to eat kasujiru, a famous Japanese soup made of sake lees. It's quite rare to eat this soup at a restaurant. Normally it is only served at home. At the restaurant was a display of little sculptures related to the hinamatsuri which means doll festival or girls day. After eating the delicious soup, we all went home. 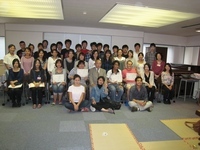 On May 6th and 7th we escorted the short-term students to Mount Kurama. It is a mountain to the north-west of the city of Kyoto. It's the birthplace of the Reiki practice, and is said to be the home of Sōjōbō, King of the Tengu (long-nosed goblin), who taught swordsmanship to Minamoto no Yoshitsune, a Japanese general who lived from 1159 -1189. 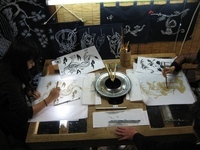 Kurama is also the location of the annual Kurama Fire Festival. 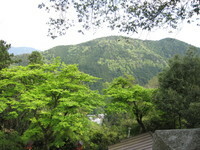 There are various temples on top of the mountain that are regarded as a national treasure. After a 30 minutes drive we arrived at the foot of the mountain. We rode the cable car and walked around for about 2,5 hour. It was really nice to see the view of the surrounding area from the mountain. It was sometimes hard for students who aren't used to mountains and steps but everybody thought it was definitely worth going to. 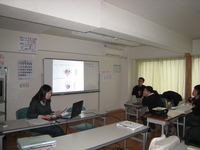 The school also planned to go to Mount Kurama on 07-05-2010 but because of the heavy rain, it was decided to go to interesting places inside buildings. We went to the kaleidoscope museum and the disaster prevention centre. We went to the kaleidoscope museum first. Various kaleidoscopes were displayed in the room. Everyone seemed to be very interested in the various objects they saw when looking into the scopes. After that we followed a workshop about making our own scope which was very interesting and it was very easy to make. We could take our own kaleidoscope home. After that we got in the car again to drive to the prevention centre. There were various simulation rooms. Firstly we entered the typhoon simulator which had winds until 32km/h. We had to wear safety glasses and had to remove earrings, necklaces etc for safety. After that we entered the earthquake simulation living room. It could produce earthquakes at maximum 7 on the Richter scale. This can be concerned very heavy. As soon as the room began to shake, we had to hide under the table as quick as possible. When the first shock ended, we were instructed to put out the heater, the stove and open the door as quick as possible and get under the table again to wait for the aftershock. It was hilarious to see the other students panicking. There were also various disaster related videogames, a CPR training course and a 3D earthquake movie room. Although it was a shame we couldn't go to Mount Kurama, everybody had lots of fun today and in the end that is all that matters. On the 14th and 15th of May, we escorted the short-term course students in groups of 3 or 4 people to the Katsura Imperial Villa. The Villa is not only a holiday house of the emperor, it is also a famous touristic spot. We had very nice weather those 2 days so the garden looked very beautiful. The guided tour takes 1 hour but everybody was so intrigued by the various views of the fascinating garden that it seemed that the tour took for about 15 minutes. No matter how many pictures you take, you can only witness the beautifulness of the garden when you go there for yourself. We can recommend everybody to go there but please keep in mind that you have to reserve upfront and that you have to be 18 years old. 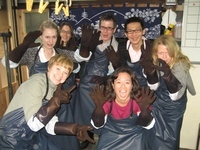 On the 13th and 14th of May, we divided the short-term students into groups and escorted them to experience the whole process of roketsu dyeing which is a unique traditional way of cloth dyeing in which wax is used to block dyes in area finely drawn by hand on cloth. 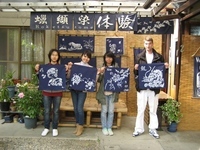 Everybody chose their personal favorite amongst various drawings and drew it on cloth by using wax as paint. They were very happy after hearing that everyone could take their own creation home. It was a very informative and interesting experience. 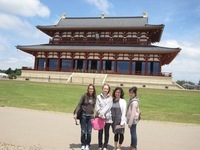 On May 20th and 21th we escorted the short term students to Uji, a city south of Kyoto. 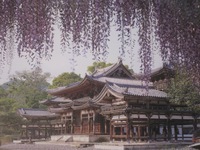 Uji is famous because of the world heritage Byōdō-in temple, the Ujigami shrine and tea cultivation. 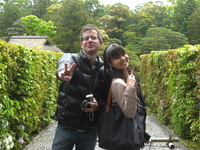 Firstly we went to the Byōdō-in shrine. We walked through the garden and afterwards we entered the phoenix hall and museum. You can see Byōdō-in temple on the 10 yen coin and the phoenix on the 10.000 yen note. Afterwards we visited a 400 year old teashop. In this shop the students made Japanese macha (green) tea in a way it was produced 300 years ago. Afterwards they drank their own tea and ate sweets. If you put all your effort in to make something it's always tasty! 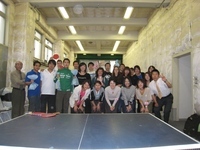 A table tennis tournament took place at Minsai for new students on the 26th of May.A team consisted of 3 people and there were prizes for the best 3teams. 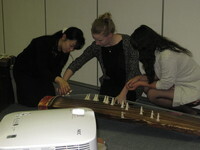 Among all kinds of contests there were enjoyable matches between females between and intensive matches between males.The non-playing students cheered loudly for their teammates.It's good to have a workout sometimes between studying isn' t it? Short-term students extra curricular activities. 27th and 28th of May. 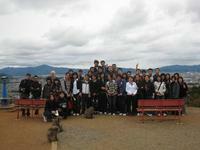 Also this week the short-term students went on an excursion. This time we escorted them to the city of Nara. 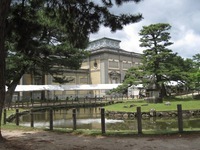 It's an old and historical city that is mostly famous because of the Todaiji Temple and the Heijō-kyō Palace. It took about 1,5 hour to Nara by car. After arriving we went to the Nara National Museum to see an exhibition named Imperial Envoys to Tang China: Early Japanese Encounters with Continental Culture. Various old artifacts, paintings, scrolls, pots and statues were displayed. Afterwards we strolled around Nara and ate lunch. We took the bus to Heijō-kyō. The Palace site is a listed UNESCO World　Heritage together with other places in the city. It was a very interesting day. 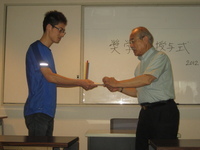 We welcomed Kanehisa Sokyu, a kyogen teacher on the 10th of June to instruct at our weekly cultural exchange class. The students were very excited to see a kyogen performance for the first time and having the chance to participate in the play themselves. 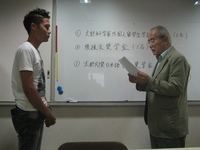 While getting an oral instruction by the teacher, the students performed a play called Bonsan. Kyogen looks a lot like comedy. This kind of fun surely exists all over the world doesn't　it? There are various field trips to festivals, all kinds of information sessions and tests related to future studies in July.The foundation course students have periodical exams at the moment. Maybe it's a bit fast but the staff of Minsai is thinking about writing wishes on a small piece of paper so that the students will have good results and that all the fieldtrips to festivals and excursions are fun and pass without any problems. 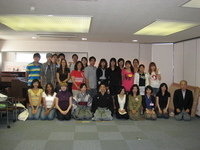 In addition, the long term students have summer vacation from the 16th of July until the 16th of August, but there are classes and field trips for short term students, participants of the summer course and students that started studying in July with the exeption of Obon festival when the school is closed. 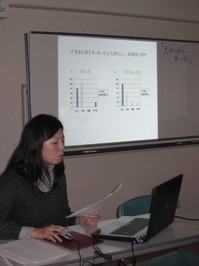 Yesterday, a teacher of Doshisha Womens University and 10 students that are studying Japanese Language and Japanese literature in order to become a Japanese teacher came to inspect our school. 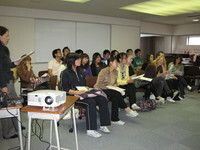 After a quick tour they attended the oral class for students at beginners level. At first everybody seemed a bit nervous but we got along quite fast also because there was no big age gap. 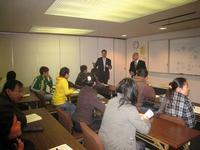 In spite off the short time, the conversation went smoothly and various topics were discussed. Afterwards we exchanged contact information and took pictures to strengthen our bond. While I was looking at the young students having fun, I was thinking; "isn't it wonderful that you can meet a lot of nice people in only 45 minutes" and "it's great that with a small meeting without exaggeration you can accomplish cultural exchange." 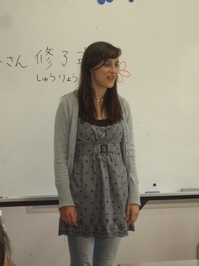 Japanese teacher with 12 years of experience. Chinese thought: No offence! Because there is beautiful things and wonderful things. Japanese thought: Chinese people talk loud. Chinese thought: Because of China's population, there are always many people around us so we have to talk loud to communicate each other. We are not mad! There were many other things we talked about and we were like "I see." " hmmmmm" all the time. We believe that it is important to go ask profound questions regarding other cultures. Asking questions is often more important than thinking to have found the right answer. The short-and long-term students followed a cultural class about the Gion Festival and the Gozan no Okuribi (5 big fires that are lit on mountains around Kyoto). 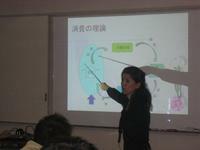 The student were very surprised by hearing that ancestral spirits come back to earth during the O-bon festibal. After hearing various interesting stories about the festival in Kyoto, the students participated in a true/false quiz with very difficult questions about various events in Kyoto and some answers even amazed the teachers. 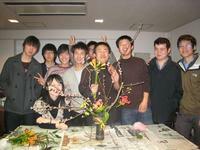 For example none of the teachers knew that there were about 350 liquor shops in Kyoto about 350 years ago. 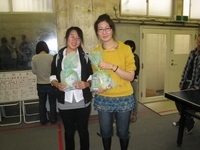 The winners of the quiz were rewarded with a price. Everyday many students come to our school by bicycle. Normally the school staff tell the students about the bicycle rules in Japan, but today was different! During the traffic guidance session a police officer visited us. 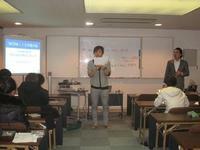 He also talked about holding important identification documents, and safety rules for riding a bicycle. Volunteers from the University joined us too. Let's follow the rules and enjoy the life here! It has been hot, even in September. Many students are amazed about how hot it has been, but they come to school happily every day. These days we have many briefing sessions for the outside enrollments of the school; all the students who are taking the university entrance exam are really serious and often have a career counseling with teachers. 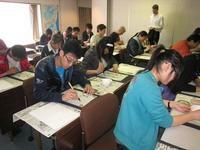 New students will have fixed term exam mid September so they study very hard at school and home. 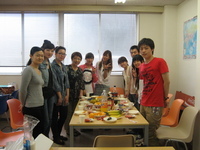 Spring term is finishing 28th Sep, and the new term is starting from 5th Oct. We are planning to have BBQ party beginning of Oct.
On the last day of the spring term, we had a graduation ceremony for five students. 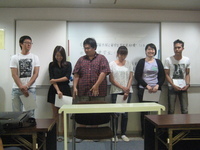 All students gave a great speech. One student who has a good sense of humor always made other students relax - she also wore a Santa Clause costume on Christmas day. 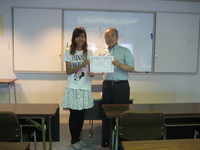 Another student who is reliable and everyone called her Sister in Japanese. 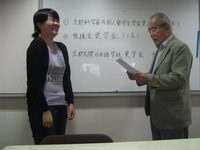 Then, a student who is always smiling, loves to talk gave a speech. 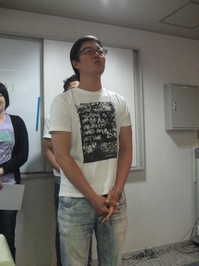 Finally we heard some words from a student who is quiet but always concentrated on studying. All five students have distinctive characters. It was not so easy to leave the room after the ceremony finished. 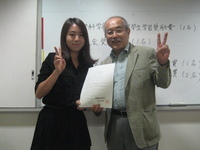 The other day, we held our scholarship award ceremony at Tenjingawa school. 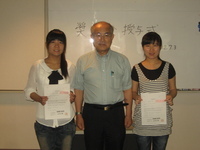 The students who got a scholarship seemed so happy since it has been recognized for their daily efforts. And also, they made a good speech in Japanese. We are very proud of them all and best wishes for their continued success.